Steve Christiaens died at 1 p.m. on Christmas Eve last year. Hospice nurse Jolene Wilkinson was at his bedside in 15 minutes. 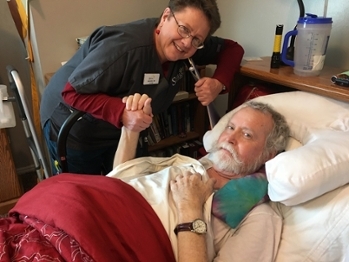 Over the four months of Steve Christiaens’ hospice care, his wife and his nurse forged an intangible bond – personal and profound, but still professional. On Monday night (May 9), Christiaens and Wilkinson’s employer, Solstice Home Health, Hospice and Palliative Care, will recognize her along with nearly 200 other Utah nurses at the Honors for Nursing gala at Little America Hotel. The gathering was started 22 years ago by alumni of the College of Nursing to recognize the state’s extraordinary nurses. “From an event that first began in the basement of the college building, Honors for Nursing has grown to become a wonderful opportunity for Utahns to recognize the nurses around the state who provide such critical care for the sick and most vulnerable among us,” says Melanie Osterud, advancement director for the college. Hutton, a psych/mental health nurse, has taught at the college for more than 40 years and was pivotal in establishing Utah’s chapter of the American Foundation for Suicide Prevention. For more than 20 years, she has led group grief counseling sessions for the college’s Caring Connections Program. Honors for Nursing recognizes the work of nurses from each of Utah’s four main health care organizations – Intermountain Healthcare, IASIS Healthcare, MountainStar Healthcare and University of Utah Health Care – as well as individual nurses honored by their colleagues and bosses. Solstice Home Health also is a “Champions of Nursing” sponsor this year. For Christiaens, it was important to recognize the steady hand of the hospice nurse who walked her through her husband’s dying process. Steve Christiaens was diagnosed with bladder cancer at 64 years old, in March 2015. He quickly had two rounds of chemotherapy, but the cancer had spread. By September, he was in hospice. Hospice presents a unique challenge for nurse family members, Glenda Christiaens says. Most people expect them to be able to—to want to—do the caregiving. But Christiaens says she wanted to be Steve’s wife, not his nurse. Besides the physical care she provided, including healing touch and music therapy, Christiaens says Wilkinson’s calm presence and quirky humor provided the backup she needed to simply focus on her husband of 39 years. Wilkinson remembered the grandkids’ names, which kitchen drawer the spoons were in. And she did all of it while keeping a professional boundary. The first time Wilkinson and Christiaens hugged was right after Steve’s death. They met briefly for the first time since his death early in April. But on Monday, they will sit together at Honors for Nursing.